ReVamped and upcycled jewelry boxes and chests are always good sellers for me in my booth at the antique mall. Finding the right pieces to make-over can be a bit of a challenge though. The first thing I always do is look inside the drawers. So many of the old jewelry boxes have that cheapo velvet fabric lining the drawers, and it’s usually stained and dirty and impossible to remove. So I pass if the drawers (innards, as I like to call them!) aren’t clean. The next thing to check for, if you are going to be repainting or re-covering your piece, is to be sure that the drawer pulls/knobs are removable. On this piece that I recently made-over, I had already removed the drawer pulls when I remembered that I needed to take pictures! A time or two in the past, I HAVE bought pieces that I could not remove the knobs from, and just painted the whole thing, knobs and all; but I avoid that as much as possible. I just sand the paint off the pulls/knobs as much as possible in those instances. How sweet are the drawer pulls on this piece!?!? The insides of the insides of the drawers were clean and painted black, which was totally fine. Except for the fact that I was re-painting the piece an off-white and the contrast was quite stark. My solution? Glue some paper to the inside bottom of the drawers. I used old dictionary pages this time. In the past, and on full size dressers/chests I have used; pretty wrapping paper, vintage wall paper, vintage sheet music, old road atlas pages . . . really, ANY kind of paper that you can cut to size will work. I also added some of the same paper to the recessed bottom of the chest, just for fun! Don’t forget to paint (or paper!) the BACK also. 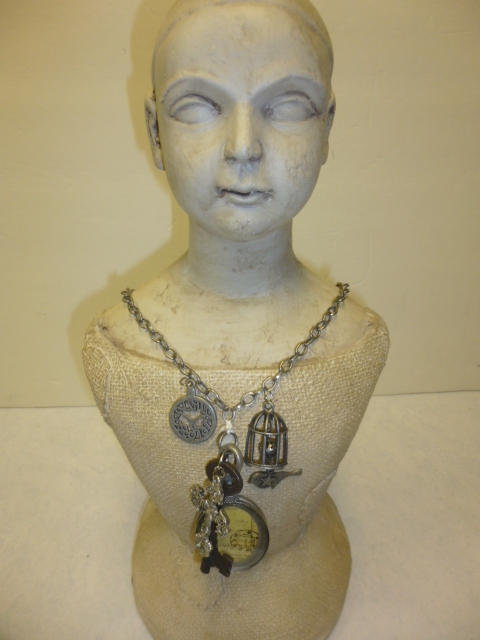 *This piece has already SOLD in my booth at Stars Antique Mall in Portland, Oregon. I wanted to try something totally different for birthday gifts for my two best friends this year. After being friends for 44 years, they are pretty used to getting some ‘experimental’ hand crafted gifts from me. 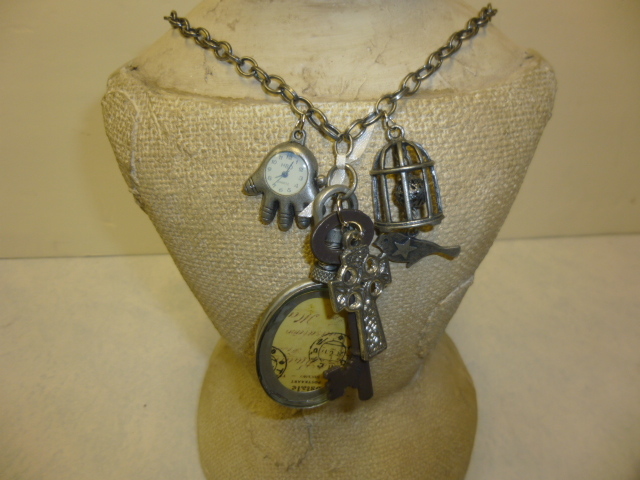 I decided to dabble with JEWELRY making! Every time I go into a craft store, I spend at least half my time there wandering in a daze through the jewelry supply sections! 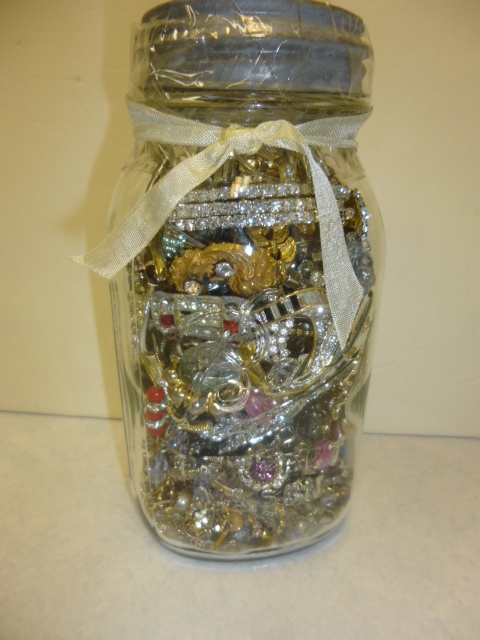 SO many pretty sparkly and shiney things to look at! After years of resisting, I finally succumbed and bought some jewelry making supplies! I started with the big oval yellowish pendant. (you can see it better in the other pictures) It has a picture of a FROG on the other side! The two friends for whom I was making these and I collected frogs when we were in high school together; so HOW could I resist?!?! I chose to face the from picture ‘backwards’, so it would be ‘closer to their heart’; just as their friendship is so close and dear to my heart. Then I just looked around for other charms that caught my eye and were meaningful to us. A clock: because they have always made time for me in their lives. 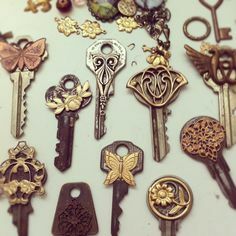 A key: because of the secrets and scars I keep hidden from everyone but them. A cross: to remind us of God’s love and grace. A bird and a cage: because we truly are ‘birds of a feather’. I chose to TIE some of the charms on with thin satin ribbon (just to be different!) instead of use jump rings. 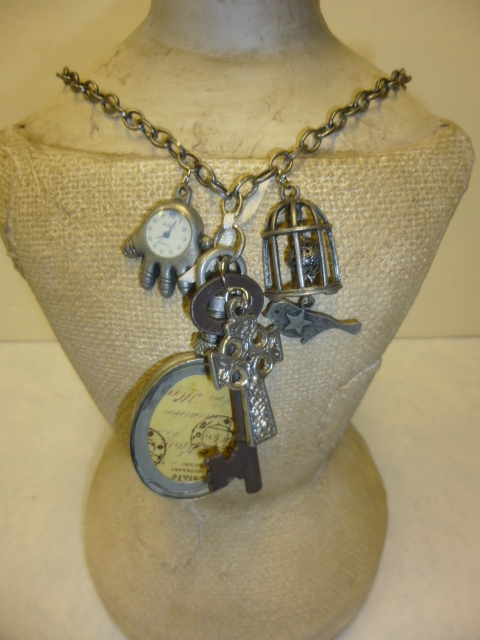 The clock and the cross charms are different styles on each necklace because I bought the charms in sets that had a variety of charms. Will I make more jewelry? Maybe. 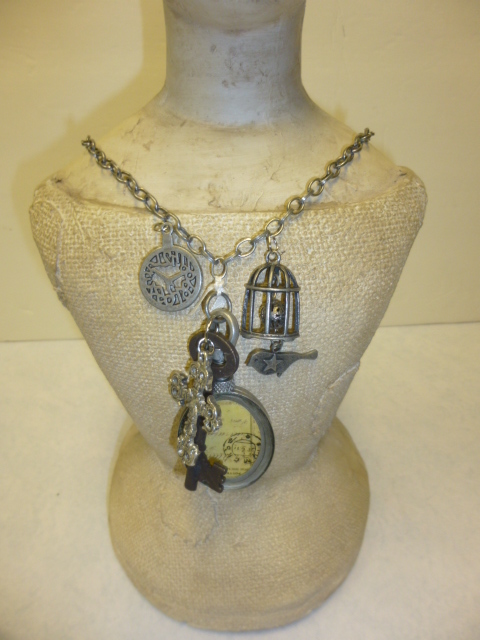 I did manage to acquire a ‘few’ more jewelry components that I needed to make these 2 necklaces . . . so I will have to figure out a way to use the leftovers. 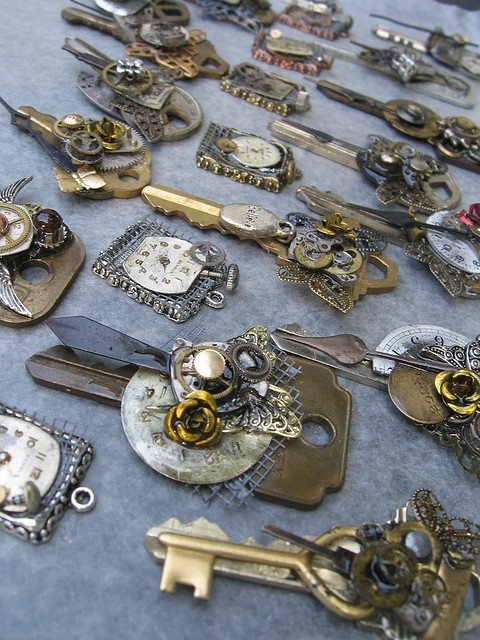 I always have something that I can use KEYS on! Those projects ought to have me all warmed up for the next REALLY BIG BLING PROJECT! I really don’t ‘look for’ jewelry stuff. But for some reason this treasure trove on vintage finery caught my eye at Stars one day last June as I was leaving after working on my booth. It just happened to be a short time after my son announced his engagement. It was a good price. Better price with my dealer discount, so I bought it. 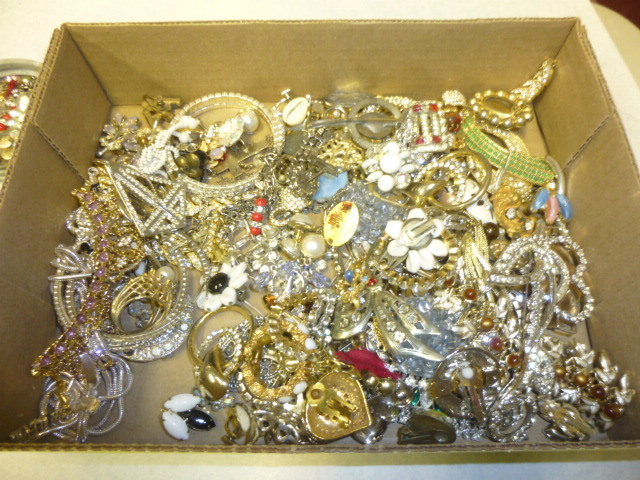 Just LOOK how much amazing old jewelry I have to work with?!?!? So, what am I going to DO with it?? I want to make a wedding bouquet for Megan for my son and her wedding! 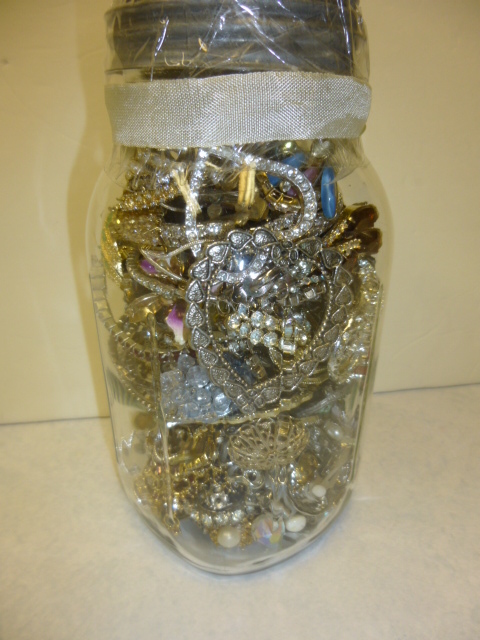 Have you SEEN the amazing ‘vintage brooch bouquets’ on Pinterest made from old jewelry like this? You MUST go look! I HOPE she will like it and want to carry it for her bridal bouquet. BUT, I know it’s possible that she always dreamed of carrying a big flower bouquet on her wedding day. In which case, I will be content for her to have it simply as a special gift and remembrance of their wedding day.